The divisive battle over the Supreme Court justice is providing a rallying cry for Maine campaigns in the final month before Election Day. Within an hour of Sen. Susan Collins declaring her support for Brett Kavanaugh last week, a progressive activist group made its own announcement. Sen. Susan Collins talks to journalists after speaking in favor of Brett Kavanaugh on Oct. 5. The jury is still out on which party, if either, the Kavanaugh fight will help in midterms in Maine. 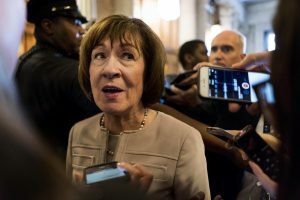 Rather than protest against Collins, the Maine Common Good Coalition said it would be “channeling our outrage” elsewhere by knocking on doors to support Democrats this November. Yet as Republican State House candidate Matt Stone sees it, the Kavanaugh fight and Collins’ role in it had a remarkably different effect. “In a way, I think she single-handedly united the Republican Party,” said Stone, a West Gardiner resident running to represent portions of Kennebec County in the Maine Senate. One week after Kavanaugh’s appointment to the Supreme Court, both Democrats and Republicans in Maine are claiming that the ugly nomination battle energized their bases ahead of the crucial midterm elections. Whether that energy will be sustained until Nov. 6 could help decide which party controls the governor’s mansion and the Legislature for at least the next two years. For those entrenched in the campaigns, it’s not a stretch to link who wins elections for local House district seats or the Maine governor’s mansion with who sits on the nation’s highest court nearly 600 miles away. In the weeks leading up to the Kavanaugh vote, Democrats and many observers predicted that the #MeToo movement and sexual misconduct allegations against the nominee would help fuel a potential “blue wave” at the ballot box. National polls showed a significant “enthusiasm gap” between Democrats and Republicans headed into the crucial mid-term elections. Yet conservatives and Republicans now contend that Democrats’ treatment of Kavanaugh – combined with the in-your-face protests aimed at Collins and other Republicans leading up the vote – has re-energized their base. There have been no Maine-specific polls since the Kavanaugh nomination. But a Washington Post/ABC News poll of more than 1,100 adults nationwide found that 51 percent disapproved of Kavanaugh’s confirmation. While a larger proportion of respondents were more likely to vote for Democrats than Republicans because of the Kavanaugh fight – 33 percent to 27 percent, respectively – 39 percent said it would have no impact on their voting behavior. 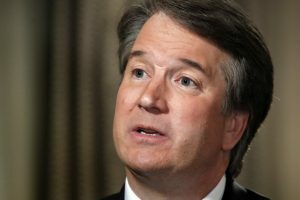 Brett Kavanaugh answers questions during a Fox News interview Sept. 24 about allegations of sexual misconduct against him. Republicans now contend that Democrats’ treatment of Kavanaugh during the confirmation fight has re-energized their base. The rhetoric has been comparatively tame here in Maine despite the close races for governor and the 2nd Congressional District. In addition to those races, Republicans are also trying to hold onto what is now a one-seat majority in the state Senate. Stone, who is challenging incumbent Sen. Shenna Bellows, D-Manchester, said the Supreme Court fight isn’t the first issue on the minds of many Senate District 14 residents he meets. But he said it certainly comes up in some discussions. Bellows indicated that voters are focused on local issues important to them. “What I’m hearing from voters are concerns about skyrocketing health care costs and high property taxes, and an appreciation for those of us who are working on that,” Bellows, who is seeking her second term in the Maine Senate, said on Friday. The Kavanaugh fight seems unlikely to affect the outcome of Maine’s only U.S. Senate race, absent a major shift in public sentiment toward incumbent Sen. Angus King. An independent who caucuses with the Democrats, King opposed Kavanaugh even before the sexual assault allegations surfaced because of concerns about the judge’s positions on reproductive rights, health care and presidential power. A Morning Consult poll released this week said King was tied with two other senators for the third-highest approval rating nationally at 58 percent, although the survey was conducted before the Kavanaugh vote. But the campaign of King’s Republican opponent, state Sen. Eric Brakey of Auburn, said donations have “surged” since Kavanaugh’s confirmation. While the campaign had been averaging $500 to $1,000 a day in donations, it received $5,000 on Thursday and a total of $41,000 since the confirmation. It is impossible to tell how many – if any – of those donations were tied to King’s position on Kavanaugh. Brakey’s campaign has likely received a visibility boost in recent weeks from outside groups airing television ads in support of his campaign. And during the debate over Kavanaugh, Brakey did not actively campaign on the issue. Jack Faherty, spokesman for King’s re-election campaign, said King heard from thousands of Mainers on the Kavanaugh issue. And many people have stopped the senator on the street, attended events and called into radio programs just to thank him for his vote opposing the nominee. “The enthusiasm around Senator King’s re-election isn’t about one vote, but it is about Senator King’s record of listening, studying and explaining his positions to Maine voters,” Faherty said in a statement. Other candidates hitting the campaign trail say that, not surprisingly, voters remain divided on Kavanaugh’s appointment. State Sen. Amy Volk, a Scarborough Republican facing a close election in the politically diverse suburbs of Portland, said the issue cuts both ways. “I think it is probably going to benefit Republicans more than Democrats because Democrats were already energized,” added Volk, who was outspoken in her support of Collins after Maine’s senior senator laid out her reasoning for supporting Kavanaugh. Volk’s Democratic opponent on Nov. 6, Dr. Linda Sanborn of Gorham, said she is certainly still seeing motivated voters in her social media feeds. “It feels to me like it has energized folks on the Democratic side to get people out to vote,” Sanborn said.